I had an epiphany last week that I truly don’t know who my competition is. Then I started to think about why that is and overall I came to the conclusion that it is because it varies depending on the marketing platform. In years past your competition was the guy down the street who does the same thing that you do. Today, competition comes from across the globe and on multiple marketing channels. With that in mind I am trying to figure out who my competition is across the interwebs and I am dragging you along for the ride!!! Figuring out my competition on Facebook was much easier than on Twitter. For Facebook I primarily have my profile (person) and my business page (marketing artfully). On Twitter I have found that having one “main” account (taradactyl) is fine, but having little niche accounts actually makes more sense for growing a targeted, rabid following. For example, my EbookNerds and TweetingHomes grow much faster because they have a targeted focus (self publishing and real estate). So for the purposes of this post, I am going to try and figure out who my competition is for Real Estate Marketing (tweetinghomes) on Twitter. The easiest way to start is to do a simple search in the Twitter search bar for your industry. After you do that you can check out the competition and find out more even more by following the hashtags (like #realestate #marketing). The Twitter advanced search tool allows you to search a number of different criteria including keywords, hashtags and even within a defined geographic criteria. So in real estate marketing, there are some big players who have been around for a very long time. Brian Buffini, Hobbs Herder and Tom Ferry are three who come to mind. I am sure you have some of the “usual suspects” in your industry. You will want to check out their profiles to see if they are actively working their accounts and if they have any best practices you can copy. Many times you can do a Twitter search for a specific type of Twitter account and people will have made a blog post about it. For example you could search Google for “best marketing people on twitter” and get a number of different posts recommending people to follow. You can also find the top listings for “real” search and then check their Twitter accounts to see if they are actually using Twitter as a marketing tool. A great tool to use is Tweepz.com. This site lists Twitter accounts according to various criteria like how many followers and the date the account was created. A REALLY good resource for finding people to follow or scoping out your competition. Well hopefully that helps! 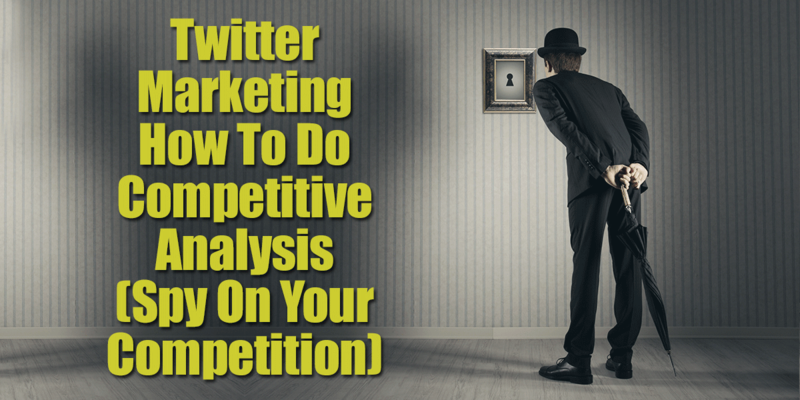 There isn’t as much agony over figuring out your Twitter competition as there is on other sites. It is pretty straight forward and easy to check out!